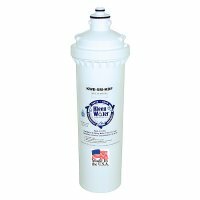 KleenWater 4.5 X 20 Inch Whole House Lead, Chlorine and Sediment Removal Water Filter System Made in Italy with 1 Inch Threaded Inlet / Outlets - New and Improved. Activated carbon block water filter cartridge technology is ideal for residential "point of entry" chlorine removal provided dirt/sediment pre-filtration is employed. Without sediment pre-filtration carbon block filtration is apt to cause severe flow rate restriction. Our PWF4520LRDS is a complete system which protects the carbon block cartridge, greatly extending its service life. This filtration system operates in series. First in series is the KW4520G dirt, rust and sediment filter cartridge. This 5 micron filter cartridge features ends caps and gaskets which facilitate a positive seal and superior filtration. The transparent housing allows visual inspection of cartridge condition. 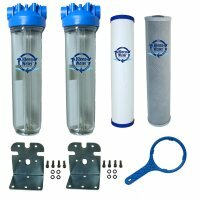 The second water filter employs our PWF4520LR cartridge. This carbon block water filter can remove chlorine and chemicals for 18,000 gallons with flow rates up to 6 gallons per minute. With the sediment pre-filtration in position the absorptive (chlorine / chemical removal) capabilities of the carbon can be completely exploited without substantial flow rate reduction. Thus the carbon block cartridge will last the estimated 2-3 months without premature failure. Our PWF4520LR coconut shell carbon block filter employs Metsorb Lead Removal Media. This media is made in the USA by Graver Technologies and is NSF Certified. The filter cartridge is made in Taiwan and is NSF 42 certified. The Kleenwater 4.5 X 20 inch transparent polyethylene water filter housing is manufactured in Italy from the highest quality and safest materials. This filter is very rugged and boasts a 120 psi maximum working pressure. A built-in pressure relief vent and a spanner wrench are included for easy periodic cartridge change out. A drain port is another convenient feature which allows the water to be drained from the filter simplifying cartridge change. Two individual heavy duty zinc coated steel mounting brackets with screws are furnished to facilitate a professional installation.